while i've been absent from this space over the past two months, things have transitioned from a seeming state of upheaval to one of rest. without warning, andrew and i introduced some big and fast changes into our lives—although now that things have had time to settle, the changes don't feel so big. there have been so many things that i've wanted to share in the interim, so many images i've wanted to post, words i've wanted to write, and updates i've wanted to make, but i felt this strange responsibility to account for my absence and fully explain the changes before i could do so. in one of those serendipitous sequence of events, where the decision almost seemed to make itself, we decided to leave Renfrew County and make our lives elsewhere, closer to the city but still outside of city limits. part of what precipitated this decision was our discovery of a hidden black mould problem in our country apartment, which had without a doubt been negatively affecting our health and mental states. but more than the immediacy of the mould problem, we also knew that we had to plan for the future, in advance and before it hit us hard. which meant andrew leaving the bush to take a new, better-paying (although still forestry-related) job that would allow me to focus on finishing my PhD while also having easier access to the city and its resources. and finally, we simply needed a larger, more appropriate and productive space, where i could more effectively work from home and where we weren't tripping over each other, the animals, and all of our stuff. we realized that we were expending far too much energy trying with everything we had to make things work, and it simply wasn't working. we needed more than anything to make a change, and so we did. but part of making that change also meant admitting a lot of hard truths to ourselves. and so here we are, over a month later. we are still in limbo, living out of suitcases and boxes with our three animals in the attic of my in-laws' 180 year-old stone house overlooking the St. Lawrence River, as much as i am embarrassed to admit it. but i think it goes without saying that we've all been there in one way or another. you swallow your pride, take your alms with a thankful quietude, gather your resources and make your way. more than feeling ashamed, i am humbled and thankful that i have been allowed this rest. for the first time in all of our moving adventures, we have been able to take the time to find the right place to live, to steadily choose the place that we want to call home. and i think we found it—a charming two-storey apartment in an historic red brick house built in 1880 in Prescott, Ontario. like any place, it's not without its faults and quirks, but i think it is going to give us what we need. we don't move in until October, but for now the feeling of having found a place and having something tangible to look forward to is enough. the fruit of the decision we spontaneously made over two months ago awaits us, and once it is ours everything will have been worth it. 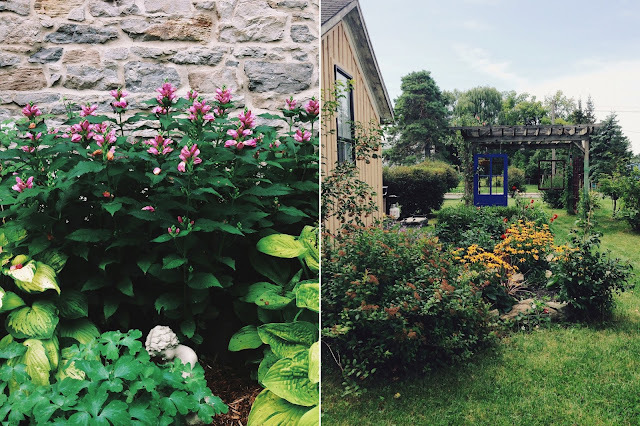 the first photo is a scene from my mother-in-law's effortless garden, which i am blessed to experience every day while we stay here, and the second is a view of the backyard at your new place. i love the installation of empty frames hanging from the arbour and even had a discussion with our new landlord about the institutional and discursive function of frames in art history—yes, i totally geeked out. Congratulations on your new space! It sounds like it will be much better for your life. I've been to Prescott once - I remember thinking it was very charming! such a beautiful and poignant account of your life-changing events. i had to smile at this: "for the first time in all of our moving adventures, we have been able to take the time to find the right place to live, to steadily choose the place that we want to call home." it gives me a light and hearty giggle right from the soul; you have had nothing short but one moving adventure after the other, often hasty, and not without a set of predicaments that affected each. this entry touched my soul kid. xo.